Callaway X-14 SteelHead irons feature an oversized, cavity back head that has a patented channel running in the back of it that creates more stability in the head for a more solid feel and more accuracy. They also have Variable Face Thickness technology, which provides more Trampoline Effect on mis-hits than ever before. 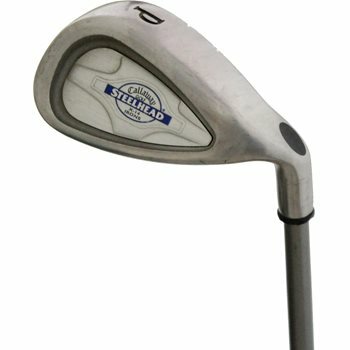 I am interested in this set of irons but I would like some pictures of the actual clubs. Is this possible? Unfortunately it is not possible for us to take pictures of the clubs that are available because we ship from multiple locations and could have more than one of the same item. Our shipping department will simply pick the item on top and process the shipment. Are the grips new, or are they in the same condition as the clubs? We guarantee the grips will be in playable condition. If they were too worn when we received them from a trade-in, we will replace the grips first. The grips could be standard, midsize, or oversize depending on if the customer that had the set before changed the grips. Unfortunately the clubs are pre-boxed, and we ship from multiple locations so there is not a way for us to notate the exact grips that will be on the club.